FEMA’s Integrated Public Alert and Warning System (IPAWS) program is still in its infancy but unfortunately it is already running into trouble. FEMA has issued a Request for Information (RFI) looking for “best methods for providing a highly reliable and highly available application and data center services” to support IPAWS in the future. IPAWS was used in many high-profile situations in 2013, but it has become apparent that FEMA does not have the necessary technology infrastructure to continue supporting the system. The RFI states the desire of FEMA to explore “mature commercial software solutions” and “commercial hosting solutions” for the system. 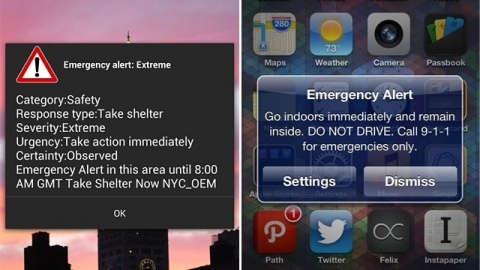 It is important to note that IPAWS is still fully functional and is an extremely valuable tool when used in connection with the Wireless Emergency Alert (WEA) system. FEMA has no plans to replace or outsource the IPAWS system. If you are still unsure what IPAWS is and how it works, please take a look at our helpful whitepaper on the subject here. The Department of Homeland Security (DHS) is offering free resources for Active Shooter Preparedness, including training workshops, webinars, video and other materials. Recent tragic events have unfortunately shown the need for education on issues such as active shooter awareness, incident response and workplace violence. The DHS is offering these free courses, materials and workshops to better prepare the public to deal with an active shooter situation and to raise awareness of behaviors that represent pre-incident indicators and characteristics of active shooters. A video entitled “Options for Consideration” demonstrates possible actions to take if confronted with an active shooter scenario. The instructive video reviews the choices of evacuating, hiding, or, as an option of last resort, challenging the shooter. The video also shows how to assist authorities once law enforcement enters the scene. The Department of Homeland Security (DHS) and the Federal Emergency Management Agency (FEMA) have released the details on the FY 2012 Homeland Security Grant Program (HSGP). Grant guidance and application kits are now available for seven DHS preparedness grant programs totaling over $1.3 billion to assist states, urban areas, tribal and territorial governments, non-profit agencies, and the private sector in strengthening our nation’s ability to prevent, protect, respond to, and recover from terrorist attacks, major disasters and other emergencies. Homeland Security Grant Program (HSGP)—provides more than $830 million for states and urban areas to prevent, protect against, mitigate, respond to, and recover from acts of terrorism and other threats. State Homeland Security Program (SHSP)—provides $294 million to support the implementation of state homeland security strategies to build and strengthen preparedness capabilities at all levels. The 9/11 Act requires states to dedicate 25 percent of SHSP funds to law enforcement terrorism prevention activities. Urban Areas Security Initiative (UASI)— provides more than $490 million to enhance regional preparedness and capabilities in 31 high-threat, high-density areas. The 9/11 Act requires states to dedicate 25 percent of UASI funds to law enforcement terrorism prevention activities. Operation Stonegarden (OPSG)—provides more than $46 million to enhance cooperation and coordination among federal, state, territorial, tribal and local law enforcement agencies to jointly enhance security along the United States land and water borders. Emergency Management Performance Grants (EMPG) Program—provides more than $339 million to assist state and local governments in enhancing and sustaining all-hazards emergency management capabilities. Tribal Homeland Security Grant Program (THSGP)—provides $6 million to eligible tribal applicants to implement preparedness initiatives to help strengthen the nation against risk associated with potential terrorist attacks and other hazards. Nonprofit Security Grant Program (NSGP)—provides $10 million to support target hardening and other physical security enhancements for nonprofit organizations determined to be at high risk of a terrorist attack and located within one of the FY 2012 UASI-eligible urban areas. Intercity Passenger Rail (Amtrak) Program— provides $10 million to protect critical surface transportation infrastructure and the traveling public from terrorism and increase the resilience of the Amtrak rail system. Port Security Grant Program (PSGP)— provides more than $97 million to help protect critical port infrastructure from terrorism, enhance maritime domain awareness and strengthen risk management capabilities in order to protect against improvised explosive devices and other non-conventional weapons. Transit Security Grant Program (TSGP)— provides more than $87 million to owners and operators of transit systems to protect critical surface transportation and the traveling public from acts of terrorism and to increase the resilience of transit infrastructure. It is important to note that all preparedness grant applications are due no later than May 4, 2012. All allocations must be accomplished by September 30th. Final submissions must be made through the Non-Disaster (ND) Grants system located at https://portal.fema.gov.